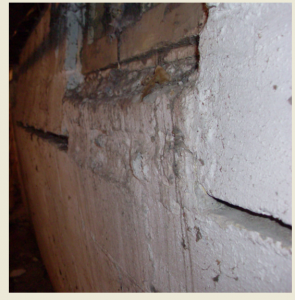 Another sign of a foundation problem is a bowed or leaning foundation wall. Bowed or leaning walls happen when foundations shift in unstable soil, or when the surrounding soil swell enough to exert great pressure against the wall. These problems will jeopardize the integrity of the entire structure if not corrected. The signs of a bowed or leaning wall are usually obvious and easy to identify. Most often a bowed wall will start with a horizontal crack, usually in the middle or upper portion of the wall. Depending on the construction of the wall, this crack may span the entire length of the wall. A leaning wall, in most cases, will lean in from the top of the wall. This can be more difficult to spot because the best indicators are found at the top of wall where the sill plate and floor joists are located. Is it better to stabilize or straighten the wall? A question that many homeowners ask is whether it’s better to stabilize or pull the wall back into place. This question is often best answered by discussing factors such as future use of the affected area, exterior landscaping, and proximity to neighboring homes or structures. If the goal is to stop the wall from bowing or leaning further, then stabilizing could be the best option. The most effective means for stabilizing the wall include Helical tieback anchors or a Carbon Fiber reinforcement system. However, if the goal is to straighten the bowing or leaning wall as close to it’s original placement as possible, the installation of Helical tieback anchors will be the most effective approach.